NEW YORK CITY: Elliot Morales, Confessed Killer Of Gay Man, Says Victim "Instigated" His Own Slaying [VIDEO] - Joe.My.God. “You could have avoided all of this from escalating to the level it did if you and Mr. Carson just went along with your own business?” asked Morales, 36, who had hurled anti-gay slurs at the strangers as they walked down Sixth Avenue on May 18, 2013. “That is so offensive,” Danny Robinson, 34, said, shaking his head as prosecutors objected. “Sustained,” declared Justice Kirke Bartley. After a drunken Morales asked the duo, “What are you, gay wrestlers?” and called them ­“faggots,” they turned around and confronted him, prosecutors say. 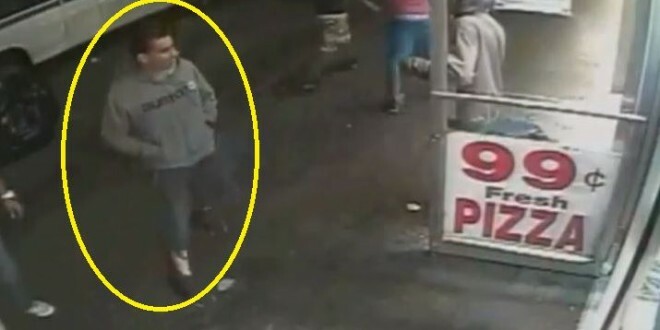 In the surveillance video, which has no audio, the men are seen outside a pizzeria. When Morales walked around the corner onto Eighth Street, the two men followed and exchanged more words before Morales allegedly shot Carson, 32. Morales is charged with second-degree murder as a hate crime and faces life in prison without the possibility of parole. He previously served eight years in prison for an armed robbery committed in the East Village.